During one of my final canning sessions to use up all of the paste tomatoes I harvested at our CSA this year, I developed a new ketchup recipe and I’m very excited about it. Last year’s sweet ketchup was very good, flavorful but not robust, although it’s one of my staples now. Last year, I also a made a spicy, slightly smoky “harissa sauce” (not really harissa but so called by Ball’s Complete Book of Home Preserving). It was surprisingly versatile. However, what I was looking for was ketchup with a kick, but not just from peppers. And here it is, thanks to ample ginger and garlic plus a little cayenne pepper. The idea came from Niloufer Ichaporia King’s tomato chutney in My Bombay Kitchen, her brilliant, award-winning book on traditional and modern Parsi home cooking. If you don’t know about King, she’s a marvel. If you don’t know about the Parsi, you should. (It’s a now-scarce Middle Eastern culture that historically melded into India, with important current cultural figures like the conductor Zubin Mehta and the very cool Harvard professor Homi Bhabha). I first heard about King on NPR a few years ago, through a series called Hidden Kitchens. I can just imagine her at my favorite farmers’ market in San Francisco where she’s seeking out ingredients and trading ideas. This came to light because her chutney recipe has been around the web recently, on blogs like The Traveler’s Lunchbox and The Wednesday Chef (thanks!). I tinkered with the proportions of ingredients and the method, creating a smooth ketchup instead of a chunky, raisin-filled condiment. 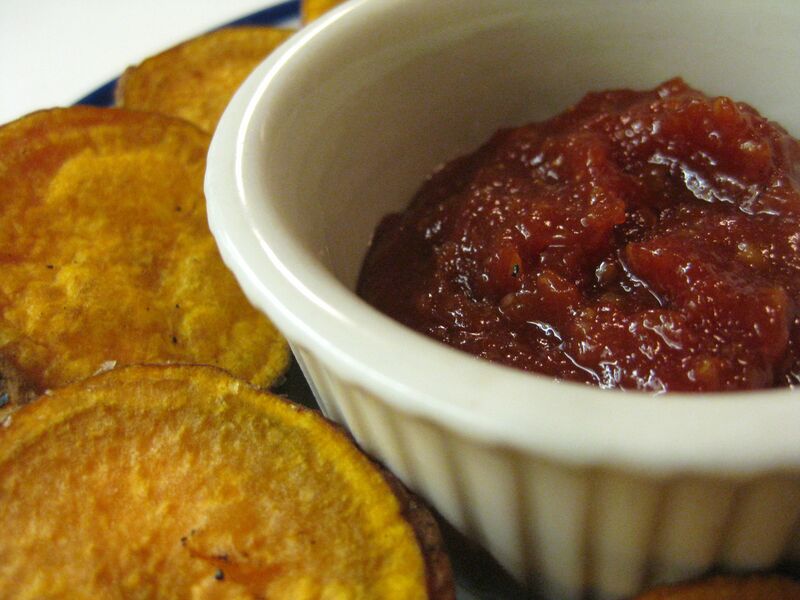 It makes an amazing dipping sauce for oven-roasted potatoes and sweet potatoes. I canned it in four-ounce jars; the recipe made 8 small jars. Place all ingredients in a large wide saucepan and bring to a boil. Boil for 10 minutes and turn down the temperature. Allow the mixture to cook gently, a gentle boil, just above a simmer for 30-40 minutes until thick. Remove from the heat and let sit for 20 minutes to let the flavors meld. Prepare jars and lids for water bath canning. Remove the cinnamon and cloves and discard. Puree the tomato-ginger mixture with an immersion blender (or buzz it in a food processor) until very smooth. Return the ketchup to the pan and bring it to a boil, cooking down further if not thick enough for your taste. Ladle into hot canning jars and top with sterilized lids. Process for 10 minutes after the water returns to a boil (15 minutes for half-pint jars). Turn off the heat, remove the canner lid and let sit for 5 minutes before removing the jars to a counter to cool, undisturbed. Preheat oven to 400 degrees. Wash and dry the sweet potatoes, scrubbing the skin if necessary. Slice into wedges or ¼-inch rounds for fries, 1/8 inch or less for chips. Sprinkle them with a little olive oil and salt, adding some herbs and spices if desired (good combinations are cumin, cinnamon and cayenne, or thyme and rosemary). Place in one layer on a baking sheet. Roast, turning once, for about 20 minutes or until browned and slightly crispy. If they’re steaming versus browning (because of moisture content of the tubers, crank up the oven to 425 degrees in the last 5 minutes or so). Serve immediately.